Thankfully, none of the above involves building two new towers in Prospect Park to pay for it. 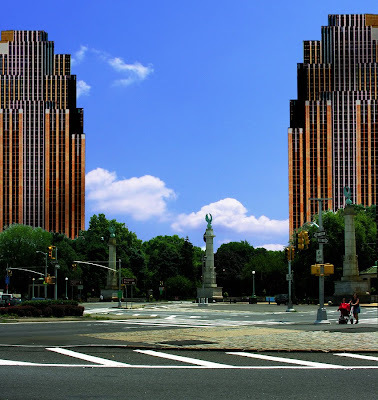 So what is this proposal to build to new towers in Prospect Park about then? Monday night at the Brooklyn Bridge Park hearing there was a lot of discussion about building housing in Brooklyn Bridge Park to pay for Brooklyn Bridge Park. Tupper Thomas, recently resigned from the position of Prospect Park Administrator, a role she was in since the 70s, spoke at the hearing saying that she was in favor of the housing and that she wished that a similar mechanism was in place to help pay for the upkeep of Prospect Park: “When Prospect Park was formed I wish we had the foresight to create a revenue source just like this one.” Well, if there were, Prospect Park’s entrance might look as it does in the picture with these two proposed towers on either side of its entrance. The image of the two towers was sent over to us by the friends of the Brooklyn Bridge Park Defense Fund to help illustrate the implications of what Ms. Thomas was apparently talking about. We don’t want to be too snide with respect to Ms. Thomas on her way out the door but there are definite problems with her idea that housing is a great way to pay for city parks. As commissioner Benepe has said previously, really the driving force on what we want to do with businesses or concessions on parkland is to provide services to park users. And I think that sometimes people think of it as commercializing the parks, but that’s, of course, not what we are trying to do. We’re trying to animate the parks with golf course, and tennis courts and bike rentals, all the things that New Yorkers really love to use in their parks, and we use concessions as a way to get the expertise in the parks so that the public can have the best possible experience. We recommend the Brain Lehrer show segment as an extended meditation on what should be considered as we walk the line in commercializing activities in parks.
. . . we could do that, but I’m afraid that at the other end the office of Management and Budget would say, OK. you keep the $90 million and we’ll take $90 million out of your budget. So either way it’s fungible money that’s paying for city services. In other words, though Ms. Tupper Thomas might imagine her life would somehow have been made easier with towers in Prospect Park, it wouldn’t. Even if you said that you were locating two towers in Prospect Park to help pay for Prospect Park all that money could actually be taken anyway to pay for the redesign of Grand Army Plaza, the police or fire department, or whatever. Simply because you put housing development inside a park doesn’t mean that it will pay for that park. By the same token, just because you build housing within a park doesn’t mean that it should be exempt from paying the same taxes toward general services that all residential development housing should be expected to pay. Who thunk that one up? (Clunk!) And what were they thinking? What were they thinking? The other day when we saw the photo below (it’s real- no joke!) in No Land Grab (picked up by Brownstowner from an earlier No Land Grab post) we couldn’t help but reel. The advertising for the proposed Ratner/Prokhorov “Barclays Center” super-subsidized Nets basketball arena is so “brutally weird” to borrow a favorite trademark phrase from Norman Oder’s Atlantic Yards Report. “Your Home Away From Home”? Who are they speaking to anyway? How in heck can a 675,000 square foot arena be anyone’s “home”? They must be pitching this advert to those they hope to rent the luxury suite sky-boxes to. I suppose those wealthy expense-account people might be lounging around on couches, with their own kitchens, might feel as if they hanging out in an apartment rather than watching a sports competition. If you want to see a rendering of the digs we are talking about go here. "We take away your home." "Your home is not your home"
BTW: One more correction. The ESDC documents say that Forest City Ratner may take at least "25 years" to complete construction on all the property it seized through eminent domain abuse, but former ESDC head Marisa Lago said she perceived construction of the mega-monopoly handed to Ratner to be on a time scale comparable to Roosevelt Island, which would make it over forty years. 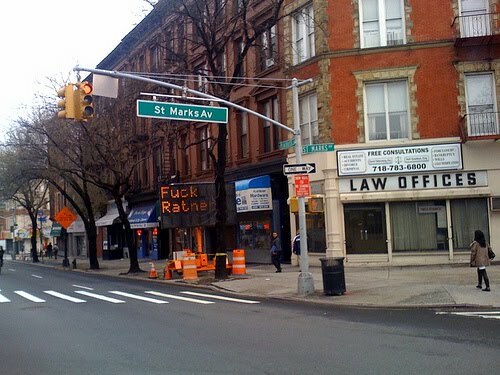 Brooklyn: Enjoy your 40+ years of dispossession. Schumer Says Atlantic Yards Area Is Not Blighted. Doesn’t See AY As A Ratner Mega-Monopoly, But Could His Support Wane? 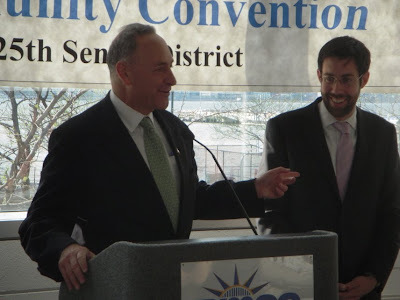 We had a short conversation with Senator Charles E. Schumer on Sunday April 11 following his statement at the 25th Senate District Community Convention held by State Senator Daniel Squadron in downtown Manhattan. We talked about Atlantic Yards and Senator Schumer said some interesting things. Schumer said that he bicycles around the Atlantic Yards area (which he says he lives “very close to”) and that he knows it is not blighted. He also denies that Forest City Ratner has been granted a mega-monoply (while attesting that he strongly opposes monopolies) even though he acknowledges that the single-developer mega-deal is being handled totally differently from the multi-developer Battery Park City. Schumer said he still supports the Ratner mega-project but used words to indicate he may not support the project now as much as he used to. He said that his support is because of the housing it will provide. Among other things, we discussed whether the no-bid Atlantic Yards effectively leverages the housing subsidies it is getting. Supplying the Senator with documentation that Atlantic Yards is not leveraging its housing subsides effectively could conceivably get the Senator to withdraw his support for the project if it is provided in a manner so as to be sufficiently incontrovertible. Such documentation, however, is already available and we are not overly sanguine about politicians, Schumer included, paying attention to facts over politics and campaign contributions when it comes to Atlantic Yards. Schumer’s statement that he knows the Atlantic Yards area well and that it is “not blighted” is extremely important because even if one envisions that Atlantic Yards is somehow a desirable mechanism to create “affordable housing” it would be illegal to seize all the acreage for it so as to give Bruce Ratner and his Forest City Ratner company his 30-acre mega-monopoly unless that area were in fact “blighted.” Though Schumer says he knows it doesn’t exist at Atlantic Yards, finding “blight” was a prerequisite for state agencies to proceed with the mega-project and that finding was a prerequisite for state and federal courts to find that Ratner’s mega-deal was legal. Cracking the Nut of the Question: Who Says Atlantic Yards Is Providing “Affordable Housing”? That doesn’t mean that a lot of scarce housing subsidy won’t be directed to Ratner when it could and should be directed elsewhere. We have written about our calculation of the amount of subsidy being concentrated on Ratner without bid. We came to a total of $638.67 million in housing subsidies alone. (See: Monday, February 8, 2010, Award of No-Bid Mega-Monopoly Means Forest City Ratner Hopes To Claim an Awful Lot of Housing Subsidy, ALSO Without Bid.) Of course the figures we gave are subject to increase as costs escalate. They are mostly based on figures publicly available in the fall of 2006. Further, as we noted in the post where we calculated that number, it does not represent the total subsidies going to Ratner for the no-bid deal which come to between $2 and $3 billion. • The need to control money going into politics from big corporations (a Supreme Court issue given the much-reviled Citizens Union case that corporations are “persons” for the purpose of campaign spending). He suggested disclosure and, addressing pay-to-play specifically saying that corporations that receive sizable contracts from the government (like Forest City Ratner?) should be barred from making political contributions. • The need for financial services reform to protect the consumer and the average citizen. Of course a big part of the financial services reform debate is addressing the way that “too big to fail” has been used as an excuse to soak the taxpayers. The same kind of concept and maneuvering is very much in evidence respecting Atlantic Yards. For those of you who wish to listen to the above referenced remarks which Schumer made just before we spoke, a sound file including them is provided here. You can read my conversation with Senator Schumer below. If you would prefer to listen to it (I acknowledge that “His Girl Friday”-style we are talking over each other to a certain extent) go here. NNY: Michael White, Noticing New York. CS: Yes, I know who you are. NNY: You made a jocular remark about anti-trust while you were speaking and I know that you have spoken about the evils of monopolies. CS: I am strong anti-trust, you bet. 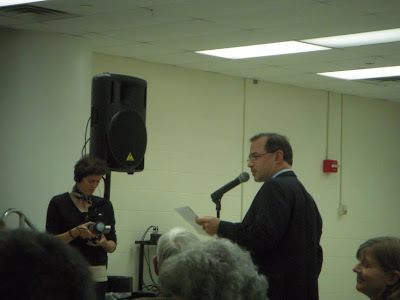 NNY: But you have been supporting Atlantic Yards which is 30 acres of mega-monopoly through eminent domain abuse for Forest City Ratner, which gives him essentially, with his neighboring properties, about 50 acres of monopoly. CS: Well it’s not monopoly. You can’t call that a “monopoly.” He’s going to build, he still is going to build. . . .
NNY: You’ve got the density that’s sitting on top of the subways. . .
CS: I know, but . .
CS: Yes it was. It’s true. NNY: And that is the way it could have been done. CS: The reason I supported it, and it’s still part of it, not as much but still, is affordable housing. We’re desperately short of affordable housing. NNY: That’s not what’s being built. CS: Oh, Some of it is. NNY: It’s like Yankee Stadium. CS: No, No, some is affordable housing. 1,800 units. It was 3,000; it’s still 1,800. You know how long I fight to get 1,800 units of affordable housing to New York? Do you know how many families that helps? NNY: And what you are doing is you are redirecting subsidies away from where they would be better leveraged elsewhere in the city. CS: It’s not subsidies. It’s not subsidies. NNY: You and I worked . . We worked on the housing programs together over the years. We go back to the 80s. CS: Yes, we did. We did. NNY: What you are doing is you are taking subsidies that would go much further with other developers elsewhere in the city. CS: Yes, well I will look at that if you’ve got paper on that. OK? I don’t think that’s true, but if it is, I will look at it. OK? NNY: OK. And the area is not blighted. I mean sidewalk cracks, the same as outside your building; Right? CS: I live very close to it. I ride my bicycle around there all the time. I know it’s not blighted. But, I care about affordable housing, I really do. OK? I do. Anyway, send me something about how it could go better elsewhere, I’d be interested in that. So might Senator Schumer further reconsider his support of the mega-project? (In fact, is there maybe even an indication of the possibility of ebbing support when he uses the phrase “not as much” saying: "The reason I supported it, and it’s still part of it, not as much but still, is affordable housing.") If there is no “blight” as he assures us he knows there isn’t, then it’s illegal. And as for the inappropriate use of housing subsidy, surely our calculations that there is approximately $638.67 million in housing subsidies involved should convince him that the amount is substantial. Our review of what Ms. Bertha Lewis of ACORN “negotiated” should convince him that the community is really getting virtually nothing in terms of true affordable housing. And the testimony of urban planner Ron Shiffman and Michelle de la Uz, Executive Director of the Fifth Avenue Committee, ought to convince that the subsidies can be far better used and leveraged elsewhere. “There are some on Wall Street who want me to say Wall Street right or wrong, and I’m not going to do it,” Mr. Schumer said in interview on Thursday, a few hours after Democrats brought their overhaul of financial rules to the floor. The Times article also notes that Schumer’s shift on Wall Street and financial services reform had put him at odds with Wall Street-defending Bloomberg. Were Schumer to withdraw his support from Atlantic Yards he would similarly be at odds with Bloomberg, who is an Atlantic Yards stalwart without whom Ratner’s megadevelopment would not be happening. (Bloomberg’s seems consistent about supporting big vested interests at the expense of the public.) Democrats (presumably Schumer included) who expect to support Obama in the 2012 presidential race may well want to put some distance between themselves and Bloomberg so they can effectively attack him when Bloomberg runs to depose Obama. Financial Patrons vs. Harmed Constituents: Political Business-as-usual? Sen. Chuck Schumer invited Harry Reid to spend Monday morning with him in Brooklyn, where some of Schumer’s well-heeled friends opened their checkbooks to help the Senate majority leader’s struggling reelection bid. Monday’s fundraiser was headlined by Bruce Ratner, the real estate mogul who owns the Nets — and who has donated more than $127,000 to Democrats in recent years. (In aggregate, the money directed by Ratner and those connected with him is probably much greater than this stated figure.) What’s going on is complicated. Harry Reid is currently the Senate leader but as the article points out about Schumer, “most Capitol Hill insiders think there’s little doubt each sees himself as the next Democratic leader if Reid goes down to defeat in November.” Factoring into the overall complexity is the log-rolling that hides who is getting what campaign money from whom for what. The question is whether Schumer can, like he did with Wall Street, collect lots of money on behalf of Democrats from Mr. Ratner and his cohorts and then take a stand on behalf of those who should be his true constituents to oppose the harm Mr. Ratner’s projects are doing to Schumer’s Brooklyn and the rest of the city? What is more important to Schumer: The money he is collecting from Ratner or a clear and consistent message for Democrats about what needs to be done in this country? When Schumer made a distinction speaking of the people vs. the special interests wasn’t the idea that he would stand up against the vested interest on behalf of the people? Financial Patrons vs. Harmed Constituents: A Clear and Consistent Message for the Schumer Democrats? While Schumer’s office won’t say how much money the event raised for Reid, cash poured in from a number of developers and real estate types. The event came just hours before a procedural vote on a plan to rewrite the rules for Wall Street, but Reid’s office stressed that the donors who turned out Monday weren’t bankers or Wall Street officials — and that, in fact, many work for Ratner’s company as well as for electrical and construction companies. Forest City Ratner is getting between $2 and $3 billion in subsidies from the government (state, local and federal combined) and Schumer’s support has been an important part of making that happen on all levels. In terms of a message that needs to clarified, is that clear enough? Postscript on Schumer’s “Affordable Housing” Unit Count vs Actual Numbers: Schumer’s reference to there being 1,800 units of affordable housing in the proposed Atlantic Yards or the mega-deal having been reduced down to the that number of affordable units from 3,000 (“1,800 units. It was 3,000; it’s still 1,800") doesn’t parse with any publicly released descriptions of what has ever been agreed to. Officially, the nominal number of affordable units (to be included in 16 of the 19 new towers to be built on the 30-contiguous acres the developer is getting) is still 2,250, half of the non-condominium units in the sixteen towers. In real terms, the truly affordable units will actually be only 20% of the non-condominium units in the sixteen towers as required by the tax code, or 900 low income units, which is less than 20% of all the units in those sixteen towers and far, far less than 20% of the units in all 19 of the new residential towers the developer plans to build on his 30 contiguous acres. Schumer might simply be flat-out wrong about his numbers for the project which is entirely possible since he hadn’t prepared for our questions. Alternatively: Might this be a hint that some sort of reduction of the mega-project is planned? The only public reference we can find to there being a reduction in the nominal number of “affordable housing” units at Atlantic Yards to “1,800" is with respect to the bill Assemblyman Jim Brennan proposed (initially in 2006) to reduce the size of the project so that 1,800 would then be number of nominal “affordable” units required of Ratner. (See: Friday, March 28, 2008, "Deeply troubled" Jeffries says it's time to evaluate changes in AY; Brennan's subsidy bill resurfaces.) Unfortunately, that kind of compromise, to reduce just the size of the project, is not the fix we need to address the corruption of the Forest City Ratner mega-deal. Yes, the project needs to be taken back to the drawing board and redesigned along the lines of the community’s UNITY plan design (which means it would be significantly smaller), but what is also needed is for the property to be taken away from Forest City Ratner so that it can be divided up and properly bid, parcel by parcel, among multiple developers, just like the Battery Park City model the senator and I discussed. That way it won’t give Forest City Ratner a government-assisted 50-acre mega-monopoly on prime Brooklyn real estate. Breaking up ownership of the huge acreage needs to be done even if the monopoly-opposing Senator Schumer wishes to deny that Atlantic Yards is indeed a mega-monopoly that he needn’t therefore oppose. In light of the New York Times report today about delays and proposed developer-favorable modifications with respect to the West Side’s 26-acre Hudson Yards Project we would like to note how it confirms and hearkens back to concerns we raised a long time ago. (Railyards Deal May Still Be Weeks Away, by Michael M. Grynbaum, April 26, 2010.) Are we really that much smarter than the MTA’s board? Or are we just more attentive to protecting the public interest? As it would be a public work, it would arguably be in the running for funding through federal stimulus, an important part of that being that the prepared parcels would later be bid out. But stimulus money cannot be given to a private developer already signed onto the deal because it would totally change the equation based upon which the developer bid to pay the public a low amount for the site. Used that way, the money would eliminate the risk developer assumed and constitute an award of enormous private benefit to the developer without bid. Atlantic Yards Report reiterated the obvious parallels to the Atlantic Yards megadevelopement. Instead of the above envisioned benefits being available for the public, the Times is reporting how (much the same way that happened with Atlantic Yards) the MTA is being asked to forgo these benefits and reformulate the mega-deal so as to make it more beneficial to the developer, Related, whose financial partner is Goldman Sachs. Under a deal unveiled Monday, Related would commit to the project with a $21.7 million down payment. Putting this in context (which the Times doesn’t): In the original deal with Tishman Speyer that was abandoned with substitution of second-choice Related as the developer, a total of $43.5 million was supposed to have been paid in two installments with the second being paid “in 2009 or 2010.” In May of 2008 Related agreed “to the same tentative $1.054 billion deal that Tishman had signed in March” with the payments aggregating to the same $43.5 million on essentially the same schedule. In other words the amount the developer must now pay is lower, delayed and reduced to being only 50% of what previously had to be paid entirely in cash. But the company would not have to close on the project — and therefore start paying the 99-year lease — until after the city’s real estate market improves. The arrangement addresses a sticking point in a negotiation that began in 2008, when the economy was still going strong. The deal had been delayed by protracted negotiations and the strains of the economic downturn, as financing for major real estate endeavors has dried up. Developers who a year ago would have gleefully bid any price for a building or a project are now delaying or abandoning projects in New York and elsewhere as the economy has slowed and many lenders have balked at financing real estate projects in the wake of the credit crisis. 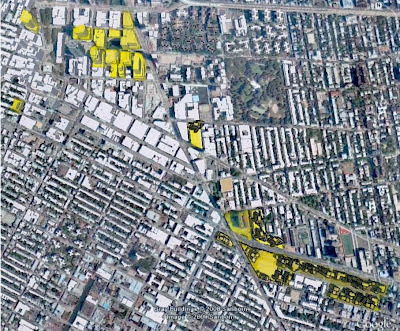 Under the plan, Related would commit to a 99-year lease on the 26-acre railyards for $1 billion, the original price. But three specific measures of the real estate market, including average prices for Manhattan co-op and condo sales, must be met before the company would be forced to close on its contract; in the earlier plan, Related would have had to close within 150 days of signing. Presumably, if the original bid had made it clear that the buyer had the option of proceeding only when the market was good, the competing bidders would have been willing to bid far higher amounts at the outset. Members of the authority’s board, who received details of the deal on Sunday, expressed frustration that they had no time to review the plan before being asked to approve it. “I really feel that in these big developer deals we get the bum’s rush,” said Doreen Frasca, a board member. The finance committee issued no recommendation on the plan. Here is some advice for "frustrated" MTA board members: You wouldn’t be getting in these kinds of binds if they abandoned the ill-advised practice of doing these single developer mega-deals and you wouldn’t be surprised with so little time to think about things if you were reading some of the Noticing New York articles where we consider these critical issue ahead of time. Comment that questioned what is proposed to be done in the park extended to other issues as well. People criticized aspects of the park’s design and (often related) spending decisions. Per our comments below, questions were raised about whether the spending is excessive (e.g. "wave attenuators" will be very expensive). The city parks commissioner, Adrian Benepe, (see picture from last night above) to whose recent statements we twice referred in our own testimony was there to make a very long (eight minute) statement that made one thing very clear: That Bloomberg and the city intend to hold back the $55 million for which it “bought” or obtained control over the park until it gets the financing arrangement it wants for the park. Judi Francis, Brooklyn Bridge Park Defense Fund President, referred to this tactic as the city holding the park improvement “hostage” to development. Is that the way that parks were ever funded before when great parks like Central Park or Prospect Park were created? Absolutely not. Here then is what we had to say about why the absurd notion that parks should self-finance themselves with development makes no sense. This comment is being offered in the name of Noticing New York, an independent entity dedicated to the proposition that developing New York and appreciating New York go hand in hand. 1. I have to remark that you* do not seem to know what you are doing in terms of your plans for the financing of this park. 2. By definition, any successful park, any park that should be created, involves exogenous or external benefit for the surrounding community. That means that, by definition, any formula that is set up to require such a park to pay for itself is wrong and skewed to favor any development (housing, etc.) that such a formula dictates should pay for the park. 3. This park, if we are to believe what most people are saying, is supposed to be a spectacular new asset for the city. If Nicolai Ouroussoff is correct in assessing that the positive effect the park “will have on New York is immeasurable” and if he isn't off-base when he equates Brooklyn Bridge Park with Frederick Law Olmsted's (and Calvert Vaux's) Central Park then the park can be expected to have substantial external benefits far beyond its boarders, which means the idea that it should pay for itself is way off base. 4. This is not to say that there can’t be a question about how much park there should be in the city or how large this particular park should be . That is an entirely different question that needs to be answered in an entirely different fashion. a. No matter what, there will an escalation of real estate values in Brooklyn, (close to the park and farther away) and in the city as a whole because of this park. Even if those escalating values are not tracked and specifically seized to pay for the park they will still accrue and flow into the city’s general fund. In essence, no matter what, they will still be paying for the park. The good thing about these increased taxes is that they will fluctuate appropriately with the economy. When the economy burgeons they will increase; when the economy falters they can, as necessary, be subject, like all other property, to increases in the general levy that comes from changes in the tax rate. If my fellow residents of Brooklyn Heights dwelling close to the park expect that they would somehow not pay more taxes when their property values go up then they unfairly (and we think incorrectly) expect to benefit in a freeloading fashion at other New Yorkers’ expense. b. Conversely, whenever real estate is developed it ought to pay taxes and it is not a good idea, as proposed in this park development formula, either to segregate those taxes from general city revenues or to lock them into a special amount via a PILOT agreement. These negotiated bargains are likely to benefit the developers too much and for too long as political handouts. 7. Whatever the “right amount” of development for is an area, that’s the “right amount.” It doesn’t make sense to reverse engineer the how much that should be based on a snapshot of what it costs to support a park in a particular year. The Bloomberg administration wants to proceed with development under this formula in the next two years. * Really? Does that mean that development will therefore be greater because today’s newly low real estate prices are projected to go down even more for the next two years? 8. Another underlying fallacy associated with nominally dedicating funds from one source to support a park is that those funds are fungible irrespective of “dedication,” a point city parks Commissioner Benepe essentially acknowledges when he goes on the Brian Lehrer show to say he is against dedicating park revenues to park support because he figures that whatever is locked in by dedication will just be taken back by the city reducing the budget on the back-end. 9. In sum, you need to thoroughly rethink this so-called plan. It’s very unworkability argues that it is more contrivance and device than anything else.